Found 7:58 pm, 28 June 2008, in a storage room in the basement of Saint Patrick's School, City Line Road, Saint John, NB, while I was moving stuff around my Art Dept materials and tools during the filming of Dead to the World II. 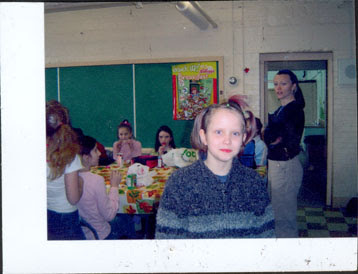 Photo was talken in the adjacent student lunch room. Ashes, Paper & Beans tonight was mainly a mix of tributes and selections from new material received. Started with James Reaney & "The Ducks", followed by "Filthy Words" & "Occupation: Foole" by George Carlin; "Beat the Drum" by Christoher Stewart; "Sin Tax" by Penn Kemp; "Howl" & "Invisible Wings II" by Geode Music + Poetry; "Pome Poem" by bpNichol; "WISH (for bp)" by Gerry Shikatani; and, from Ultraeye by Richard Rathwell, "The Whale" & "Revelations from the Whale". 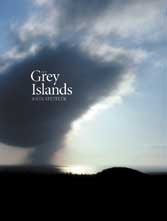 The Grey Islands (Rattling Books) by John Steffler (ISBN 978-0-9737586-0-3). Narrated by John Steffler and (in order of appearance) Frank Holden, Janis Spence, Deidre Gillard-Rowlings and Darryl Hopkins. "Support the Poet" song by Mark Kozub. sound: In Goth Daze v.a. The first half of last night's Ashes, Paper & Beans was Side B of my recording of the Writing Home Reading of 2 Feb 2008 featuring Faye Heavyshield, Alma Brooks, Biff Mitchell, Elaine Mercier, Carol Collicutt, Nela Rio w/ her poem "Paix" (Peace), Jo-Anne Elder and Faye King. Second half of the show started with "Oh, What a Life", by Ivan Coyote & Rae Spoon, followed by a run of poem tracks off the Unheard of . . . Tupperware Sandpiper Spoken Word CD: "Wouldn't You Like to fly" by Noelle Trkulja, "Word From the Girl at the Bus Stop" & "Job" by Monica S. Kuebler, "The Physical World" by Bruce McRae, "The Edge of Night" by Jeanette Lynes. 3 June, 78 pm. The Grey Islands (Rattling Books) by John Steffler (ISBN 978-0-9737586-0-3). Narrated by John Steffler and (in order of appearance) Frank Holden, Janis Spence, Deidre Gillard-Rowlings and Darryl Hopkins.